Once again the beautification of Honolulu was marred according to what was made known in the morning of this past Wednesday by Mrs. Charles Wilder, the commissioner of shade trees. The members of the commission found seven fine trees planted on Dillingham Boulevard [Alanui Kilinihama] all cut down. These trees were about ten feet tall, and they were destroyed on this past Hallowe’en night. This sort of mischief done all over this town was made known to the commission in the past; however, this recent wicked deed was by far the worst. 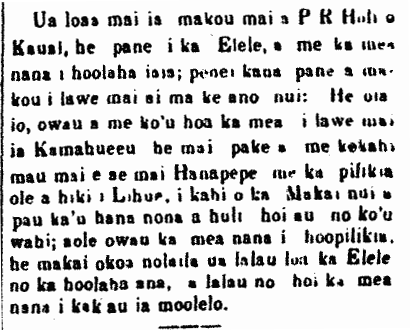 Ke Alakai o Hawaii, Buke 6, Helu 28, Aoao 1. 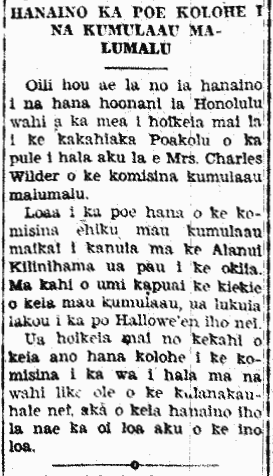 Nowemapa 9, 1933.